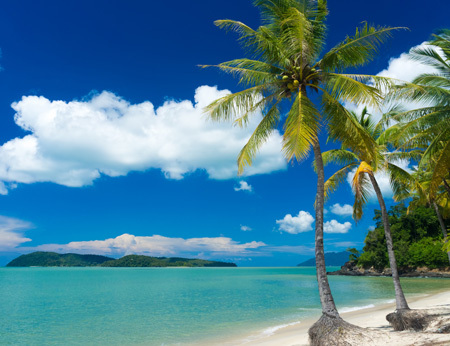 Lying in the Andaman Sea, 18 miles off the north west coast of the Malay Peninsula, Langkawi is made up of a group of 99 islands, of which only five are inhabited. 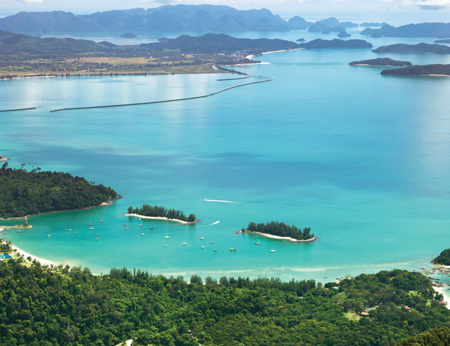 The main island, Pulau Langkawi is fringed with long, sandy beaches that lead to the glistening Andaman Sea, while the island's scenic interior is a peaceful landscape of paddy fields and small, traditional villages framed by swaying palms. Cenang Beach, on the south western corner, is the island's most popular beach. Lined with casuarinas and coconut trees, the fine sands shelve gently towards the enticing turquoise waters making it ideal for children. Behind the beach, along the roadside, there are a variety of shops, bars and restaurants offering an ideal vantage point for watching the spectacular sunsets. The soft sands of idyllic Burau Bay provide a picturesque setting for relaxation with islands dotted amongst the emerald waters and the backdrop of Mount Mat Chinchang's jagged peaks and its forested slopes. Datai Bay in the north offers an exclusive stretch of powdery sands, shared by the guests of the two luxury resorts, which curve like a horseshoe to meet the verdant rainforest as it descends from the hillside. 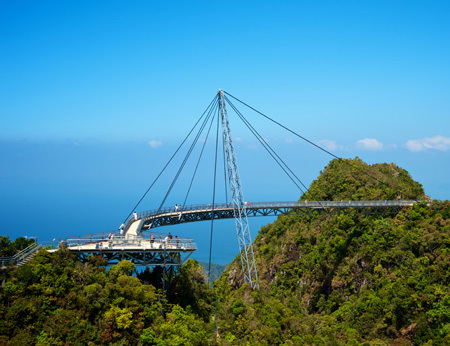 One of the island's top attractions is the Langkawi SkyCab (cable car) and SkyBridge. The exhilarating experience begins at the Oriental Village from which the cable car ascends over rainforest, lush valleys and rugged cliffs to a height of 2,300 feet above sea level. Awaiting you at the summit of Mount Mat Chinchang, aside from the breathtaking views, is the SkyBridge, a curved steel suspension bridge that sweeps for 400 feet to a neighbouring mountain. Another popular attraction is Underwater World Langkawi, which has an innovative underground tunnel that provides wonderful views of the varied marine life. Delve further into the Andaman Sea and take a trip to the Pulau Payar Marine Park, where the coral reef teems with aquatic life making it a perfect spot for snorkelling or diving. The island's natural wonders can be explored further at the remarkable Sungai Kilim Nature Park, a vast protected mangrove swamp with forests, isolated beaches and blue lagoons. Flora and fauna abounds, including macaques, lizards, otters and a variety of birdlife such as eagles, kites and kingfishers. 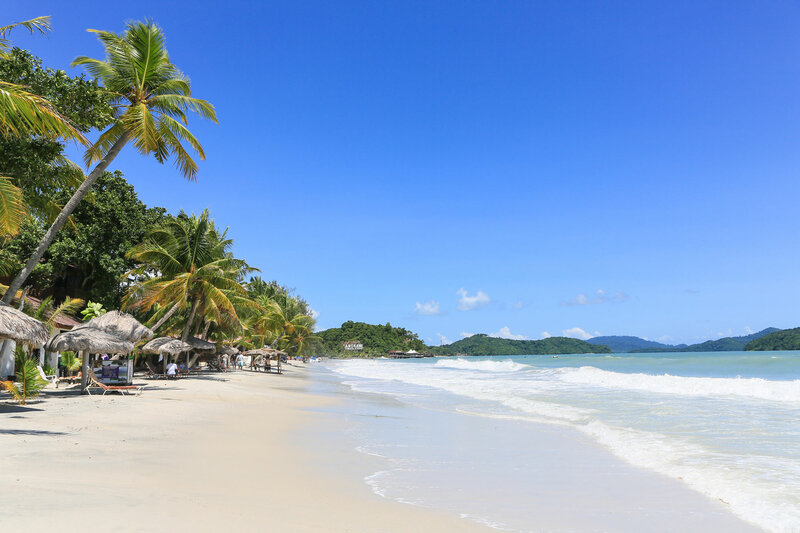 Alternatively, take the opportunity to go island hopping to see a selection of the archipelago's numerous islands, and maybe even step ashore to relax on an unspoiled beach. As capitals go, Kuah is tiny, but it does have a night market and a couple of shopping malls where you can make the most of the fact that this is a duty free island. Kuah and Cenang Beach offer the widest choice of restaurants, but hidden gems are scattered throughout the island. From tapas to tantalising Thai cuisine and delectable seafood, you'll find that you're never too far away from culinary delights. Call and speak to one of our travel experts who have experienced Langkawi personally. There are no direct flights from the UK to Langkawi. From Kuala Lumpur the flight to Langkawi takes about an hour. Flights are also available from Singapore. December through to April are the driest months in Langkawi, while the heaviest rains tend to fall between September and October. However, even during the rainy season you can expect some sunshine during the day. A Tourism Promotion Fee of MYR5.00 (approx £.85p) per room per night is payable locally.